Allergic Bronchopulmonary Aspergillos is a condition characterised by an exaggerated response of the immune system (a hypersensitivity response) to the fungus Aspergillus (most commonly Aspergillus fumigatus). 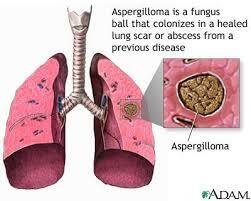 This is a condition where a patient develops an allergy to the spores of Aspergillus moulds. Predominantly it affects asthma patients but also cystic fibrosis and bronchiectasis patients. Allergic Broncho-Pulmonary Aspergillosis is a condition for which there is as yet no complete cure, so it is managed using steroids and antifungals in order to avoid any lung damage. The fungus takes up residence in the lungs and grows in the air spaces deep within. The fungus does not invade the lung tissue itself (it is non-invasive) but sets up a permanent source for irritation and allergic reaction. Sufferers of ABPA find anywhere that has increased levels of airborne mould spores can trigger severe asthmatic reactions - e.g. compost heaps, damp buildings and even the outside air in some places at particular times of the year. Avoiding over-exposure - staying indoors or using an FFP3 facemask may be advisable when this is a problem for you. For unclear reasons colonization in these patients prompts vigorous antibody (IgE and IgG) and cell-mediated immune responses (type I, III, and IV hypersensitivity reactions) to Aspergillus antigens, leading to frequent recurrent asthma exacerbations. The disorder is characterized histologically by mucoid impaction of airway, eosinophilic pneumonia, infiltration of alveolar septa with plasma and mononuclear cells, and an increase in the number of bronchiolar mucous glands and goblet cells.Aspergillus in patients with established cavitary lesions or cystic airspaces; and from the rare Aspergillus pneumonia, which occurs in patients who take low doses of prednisone long term (eg, patients with COPD). Although the distinction can be clear, overlap syndromes have been reported. There are different criteria that have been suggested as indicative of ABPA. If a patient has all eight of the above, diagnosis is certain. If a patient has seven, diagnosis for ABPA is highly likely. If the patient has asthma, eosinophilia and a history of infiltrates then ABPA should be considered as possible and the other tests can be done to attempt to confirm. Treatment consists of long term use of steroids (e.g. prednisolone) to reduce inflammation and lung damage. There are several potential difficulties with the use of steroid drugs for long periods but their use is vital to prevent the disease progressing. We can now often reduce the amount of steroids taken by ABPA patients by giving the patient an antifungal medication such as itraconazole (e.g. Sporanox but there are now several brandnames). This seems to keep the fungus under control and some people can stop taking steroids completely for periods of time. Another way to reduce the need for steroids is to reduce the inflammation. This is still experimental treatment but a new drug called anti-IgE (omalizumab) has been shown to be effective in a single patient study. This drug works by directly inhibiting a component of the immune system known as IgE. One of the functions of IgE is to promote inflammation and in this case it is permanently switched on by the aspergillosis infection, so the inflammation is permanently present and causes scarring (IgE would normally be switched off after a few days). Inhibiting IgE with omalizumab reduces inflammation and thus reduces the need for steroids. It is known that many asthmatics have fungal allergy problems, a high proportion of these having ABPA, some possibly undiagnosed. The number of those diagnosed with asthma is growing constantly. Young people with Cystic Fibrosis sometimes also suffer from ABPA, imposing further complications in their treatment. Sufferers from the genetic disorder Chronic Granulomatous Disorder (CGD) may also be prone to developing Aspergillus infections. Physiotherapy is key in managing the tenacious secretions associated with this disease, whether by support with inhaled medications or instruction in airway clearance techniques. There is no current cure for ABPA, but management of the inflammation and scarring using itraconazole and steroids usually succeeds in stabilising the symptoms for many years. ABPA can very rarely progress to CPA (chronic pulmonary aspergillosis). This is a relatively 'young' illness (first reported in 1952) with a long period of infection so it takes time for the long term results of improvements in care to become apparent. Identification of a fungal element in other severe asthmas suggests ABPA may well be much more common that was thought. ABPA is starting to lose its image of a rare and unusual infection and hopefully that will lead to increased awareness and improved management of the disease.